394 pages | 32 B/W Illus. Creativity, whether lauded as the oil of the 21st century, touted as a driver of international policy, or mobilised by activities, has been very much part of the zeitgeist of the last few decades. Offering the first accessible, but conceptually sophisticated account of the critical geographies of creativity, this title provides an entry point to the diverse ways in which creativity is conceptualized as a practice, promise, force, concept and rhetoric. It proffers these critical geographies as the means to engage with the relations and tensions between a range of forms of arts and cultural production, the cultural economy and vernacular, mundane and everyday creative practices. Exploring a series of sites, Creativity examines theoretical and conceptual questions around the social, economic, cultural, political and pedagogic imperatives of the geographies of creativity, using these geographies as a lens to cohere broader interdisciplinary debates. Central concepts, cutting-edge research and methodological debates are made accessible with the use of inset boxes that present key ideas, case studies and research. The text draws together interdisciplinary perspectives on creativity, enabling scholars and students within and without Geography to understand and engage with the critical geographies of creativity, their breadth and potential. The volume will prove essential reading for undergraduate and post-graduate students of creativity, cultural geography, the creative economy, cultural industries and heritage. "Hawkins offers a compelling, multi-faceted critical engagement with the concept of creativity that artfully synthesizes foundational and cutting-edge research in intellectually inspiring ways. Accessible and readable, this book uses astute description, careful analysis, and imaginative examples to provide a comprehensive introduction to the geographies of creativity." 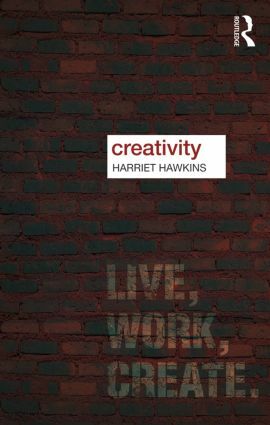 Harriet Hawkins is a Reader in Geography at Royal Holloway, University of London, UK where she co-directs the Centre for GeoHumanities and the MA Cultural Geography (Research). Her research focuses on the geographies of art work and art worlds, and often proceeds through creative practice-based collaborations with artists and arts organisations.